The standard price is £150 for the first hour and £100 for each additional hour. Magic can be spellbinding, mystifying and baffling, but most importantly it should be entertaining. With a lot of practice anyone can learn to perform magic tricks but to be entertaining is a different matter. Jack's magic can be suited for any event from children's parties to weddings and corporate events, but always his magic is entertaining. 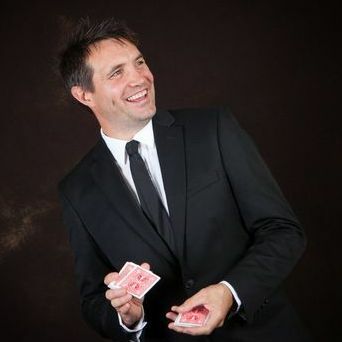 Jack is the 2 times winner of the Southampton Magic Society Comedy Cup and also the Southampton Magic Society Stage Magic Cup, he is also a member of Equity with full Public Liability Insurance. His magic ranges from close-up to stage magic, from audiences of 1 to audiences of 100s. He can perform magic for everyone from very young children to the very old (but young at heart) . Jack performed a magic show at my birthday party. This was for a small group of friends in the intimate surroundings of a hotel suite. Jack's card tricks were brilliant and he also did other tricks which were equally mystifying. Jack has a professional, humorous and relaxed approach which worked very well for us. I would certainly recommend him.